At the end of last week, aquaponics history was made again as our first MicroFarm Clear Flow Aquaponics System®, departed our campus and headed home with new Nelson and Pade Grower, Tony Stirling, just south of the border to Illinois. 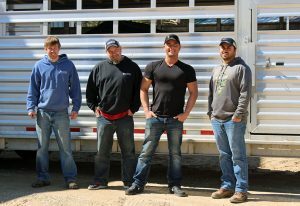 Tony is in the photo, on the right, along with Nelson and Pade Team members Matt O’Connell, Mike Keeran and Bryan Dishman. The MicroFarm Clear Flow Aquaponics System® was designed by John Pade at the end of 2016 as a way to meet the needs of our potential growers and the requirements of the United States Department of Agriculture Farm Service Agency (USDA FSA). The FSA offers a Microloan Program that is perfect for starting a small aquaponic farm. The focus of this loan is to meet the financing needs of small, beginning farmers, niche and non-traditional farm operations, and or those using hydroponic, aquaponic, organic and vertical growing methods. With the MicroFarm Clear Flow Aquaponics System®, you can get started growing and earning money in aquaponics right away. With proper environmental control and grow lights to supplement sunlight, you can achieve an annual production of nearly 13,000 heads of leafy greens and 1,000 whole tilapia. Our bundled package that we offer supplies you with everything you need: A complete, science-based system with all of the suggested additional accessories, training and assembly guidance in our Nelson and Pade Success Package, and a greenhouse! We look forward to following along on the progress of the first MicroFarm and our new grower. Welcome to the Nelson and Pade Family Tony! Why isn’t Aquaponics a Bigger Industry? This question was posed recently by a customer. It is a valid question that deserves a thorough answer. Although the aquaculture industry has been around for over a hundred years and the hydroponics industry 50-60 years, the combination of the two is fairly new. Research on recirculating aquaculture systems (RAS) began about 30 years ago. The benefit of recirculating aquaculture is that you produce a lot of fish in a small body of water. The energy inputs are high as are the risk factors. In a RAS, there is a large volume of fish waste that needs to be disposed of to keep the system water safe and clean for the fish. In the research of RAS, plants were introduced to help clean the water and this led to the introduction of aquaponics as an integrated food production system. Early on, aquaponics was really an off-shoot of research into more efficient RAS. These early aquaponic designs at the research level were not commercially viable. However, what it has evolved into is a very efficient, natural, integrated system that produces both vegetables, which is the majority of the production and profit, along with fish. John Pade and I were involved in hydroponics (soilless plant culture) and controlled environment agriculture when aquaponics was first emerging. We looked at this “new technology” as a means to provide a natural fertilizer source for organic crop production. As entrepreneurs and individuals with a great deal of understanding what it took to efficiency and profitable grow plants in a soilless system, we embarked on a journey to take aquaponics from the research and “science project” phase to a commercially viable industry. And we have done that. However, we did so very conservatively because we wanted to see it become a successful industry, not a series of failed experiments. Ten years ago we standardized our system designs, operating procedures, training programs and support protocols. We minimized the risks by adding control and redundancy. During this time period, we were also developing our ZDEP (Zero Discharge/Extra Production) systems, which we were granted our first patent on In 2014. The increased production from the ZDEP combined with our methods and procedures dramatically increased profitability beyond the early research models. In the 1990’s and early 2000’s, an aquaponic grower was lucky if they produced 2 lbs. of vegetables for each lb. of fish. We currently can produce about 12-14 lbs. of vegetables for every 1 lb. of fish with the same feed input. We are still a young industry. But that is changing quickly. Our growth at this point is exponential as more and more people learn about aquaponics. The commercial viability has really just been in place for about 10 years. If you look at the growth during that time period, it is quite impressive. Ten years ago, we were building and shipping systems that covered 2,000-10,000 sq. ft. Today we are shipping systems that cover multiple acres. Regulation. As I am sure you have experience in your ventures, doing business in the US is highly regulated. Regulations are hurdles for new ventures and new technologies. Funding. Since aquaponics is a new technology, banks are not eager to fund projects. This is beginning to change. This past year both the USDA and FSA have specifically mentioned aquaponics an a sustainable method of food production that they will provide funding for. This recognition and new funding source is trickling down to banks and investors, all of which help to increase the number of new aquaponic farms starting each year. All of that said, we are well on our way as an industry. If the growth curve from the past 10 years is applied to the next 10 years, we will see aquaponics providing significant amounts of food at all levels. Interested in more related information, check out my Changing the Food System Blog. 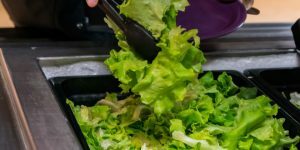 The University of Wisconsin-Stevens Point Dining Services now offers local aquaponic lettuce at the deli line and salad bar in the Dreyfus University Center, and the salad bar at Upper Depot. This lettuce is grown just over 60 miles south of campus at Nelson and Pade Inc. in Montello, Wisconsin. Aquaponic lettuce was first offered to students at these locations last semester and since then has grown in popularity. Angel Alcantar, assistant director of culinary operations on campus, says that demand is so great at Upper Debot, that the University now purchases 192 heads of aquaponic lettuce a week for that location alone.